Brad Pitt stars as a United Nations Employee who finds himself in a race against time when a zombie-like pandemic quickly spreads across the globe. He becomes the worlds last hope for survival when the lead scientist, and the initial hope for a cure, accidentally kills himself. It was a great movie. 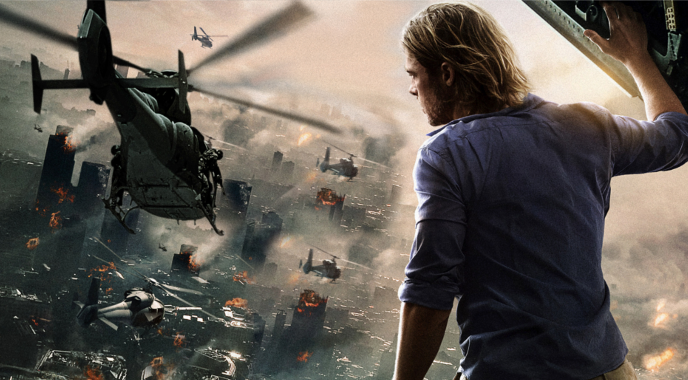 Here's my review for World War Z. The thing that made this movie so great was that it was realistic. Unlike most other zombie thrillers World War Z showed us what would really happen if a "zombie apocalypse" were to occur. The movie actually included the government which is lacking in other zombie thrillers. The government hires a young scientist who is, at that point, their only hope in finding a cure. Brad Pitt comments on how young he is and that he is fresh out of college and then we see the scientist in action. The team of security that is allotted to protect the scientist debriefs him on how to use his weapon and tells him specifically not to keep his finger on the trigger and he doesn't listen and ends up shooting himself in the head. This part made me laugh a little because it was actually funny. They specifically told him not to do something and the worst thing that could happen, happens. It's just amazing to me how unexpectedly expected it was. The other reason I really liked this part is because it was very true to the fact that being book smart does not equate to being street smart so in the case of a zombie apocalypse don't give the scientist who has never used a gun before a gun. Especially if he is your last hope for survival. So once the scientist dies it is up to Brad Pitt to save the world. When he is traveling the world trying to find patient zero it reminded me of national treasure where random things lead him to the correct location somehow. I mean the logic here was not the most sound that it could be. Nevertheless it was interesting to see what other parts of the world would be like if there was a disaster such as this. His second to last stop on his tour around the world was Israel. This was an interesting concept to add to the movie. The Israeli government allowed people into their country because they were prepared for this kind of disaster because they had a really high wall. They allowed neighboring countries to enter their land to be safe even though in the real world they are at war with the neighboring countries and I am not sure that a common enemy will bring them together. I understand the saying the enemy of my enemy is my friend but in practice does that really work? Even if it doesn't, they justified this action wonderfully by stating "the more people we let in, the less of those things we have to deal with." This was brilliant. I actually understood this reasoning, although it didn't make sense to me that they were allowing them to pray right at the border with a microphone. Do you really need a microphone to pray? I mean I'm no expert on praying but if there are zombies on the other side of the wall I'm going to be as quiet as possible and hope they go away. That's just me. What's that you say? You want us to eat you? Since everyone is praying extremely loudly the zombies get, I guess even more hungry and start to climb over each other to get to the people eventually spilling over the wall and causing chaos. One thing that might make people say "That could never happen!" is how fast the scene changes from a casual conversation to everyone running for their lives. I guess no one thought that the zombies would try as hard as they could to get food I mean it's not like the only thing going through their heads is what they are going to eat or anything. Like I said before, if there is only a wall between me and a bunch of flesh eating monsters I'm going to be super quiet and maybe put a lot more distance between me and the things that are trying to eat me. "Mother Nature is a serial killer. No one's better, or more creative. Like all serial killers, she can't help but have the urge to get caught..."
Brad Pitt, after witnessing the zombies avoid a bald little boy like the plague, figured out that the zombies would only attack healthy people. People with terminal illnesses were totally fine, other than the fact that they were going to die anyway. To test his theory, he infects himself with some random terminal illness. No, not because he is suicidal, but because he ends up trapped in the lab and he has no choice but to sit there and die or to infect himself and test his hypothesis. He ends up walking right past the zombies, but how could this happen? Doesn't the infection kill the host? The zombies are dead. Why would it matter if the host was healthy or not if the infection would end up killing it anyway? There is actually a very simple explanation for this. You will notice in this movie, these are not your typical zombies. Normal zombies walk around just wanting to eat brains. They even walk around with missing limbs and blood spilling everywhere, but not these zombies. These are next level zombies, "healthy zombies." They can run super fast and their goal is simply to infect everyone. The whole movie is a crazy and fun ride. After they figure out how to fight the zombies, I guess some people start infecting themselves with other malignant diseases and they team up with other dying people and they all go fight the zombies. In the end people that are dying fight the undead. I would say this movie is a 3.5 out of 5.